Fort Worth Self Storage at 9528 White Settlement Rd. Located on White Settlement Rd. between I-820 and Clifford St., Extra Space Storage serves Fort Worth residents near White Settlement, Blue Haze, South Lake Worth, and Chapin & Alemeda. Locals will recognize our facility next to Taco Bell, Little Caesar's, Whataburger, and Waffle House. We're also accessible for residents of nearby apartments, such as Constellation Ranch, Central Park Townhomes, Ridge Apartments, Westpointe at Scenic Vista Apartments, and Union Square. With a wide selection of storage unit sizes, climate-controlled storage, drive-up access, and exceptional security, Extra Space Storage on White Settlement Rd. 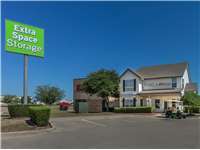 is the self storage solution for you in Fort Worth. Our White Settlement Rd. storage facility has storage units in sizes 5x5 to 12x30 with features like climate control, indoor access, first-floor access, and drive-up access. Concerned about storing temperature-sensitive items? Climate-controlled storage maintains an environment between 55?F and 85?F year-round to protect your belongings from damage caused by extreme heat or cold. Units with climate control are available in sizes 5x5 to 10x30. For the ultimate convenience, rent a storage unit with drive-up access. This feature allows you to pull a vehicle into or up next to your unit to unload and load items. These units can also be used as garage-like storage for cars, motorcycles, and small recreational vehicles. Drive-up units come in sizes 5x5 to 12x30. Extra Space Storage strives to provide a secure storage environment for customers. Our Fort Worth storage facility has an on-site resident manager, 24-hour video surveillance, and electronic gate access. At Extra Space Storage on White Settlement Rd., we're dedicated to delivering a positive experience. Our storage facility is always clean and secure, and our friendly, professional staff is here to help with whatever you need. Contact us today to reserve a storage unit in Fort Worth! Extra Space Storage met my expectations and went above and beyond to accommodate my storage needs. Very friendly, helpful, offered suggestions and showed the different options available. Wonderful, friendly staff. Kathy made the process very easy to complete. Both ladies where very delightful to work with. Very friendly and helpful staff. Facility very clean. Easy access. Gates open flexible hours. I'm a repeat customer because they're great! Very clean storage facility! The staff is very friendly and helpful. The price isn’t that bad either compared to the competition. I've had a great experience thus far with ExtraSpace Storage. Monica at the Fort Worth location went above and beyond to make my transition run smoothly. I am very pleased with this storage place and I would definitely recommend it to anyone looking for a great storage place. Great customer service! Christina helped me with choosing the right storage for my needs. Explained everything to me and made me really confident in storing my valuables at this location. Great location and access hours! Employees were very nice and helpful! Location and hours are accessible they help find the best rate to help ur needs and costumer service was one of the best. I have been SO happy with my experience. The staff is incredibly helpful and totally understands my needs. This place is awesome. I have two units there and it is so convenient. Very secure and very clean. The people are friendly and very helpful. I recommend it to everyone needing storage. Great price. Great location. Great service. This is a great location and very secure and clean. Staff is helpful as well. On site property manager is an added bonus and give that extra layer of security/peace of mind. Great, friendly customer service. Very accmodating. Clean facilities. Wouldn't use anyone one else! Staff was efficient and courteous. I was given a tour, shown size options. Facility was very clean & well maintained. Security features seemed sufficient. I would recommend this facility to friends. West of I35 on Whitesettlement Rd next to Aarons Rentals and Just Brakes. Drive southwest on I-820. Take exit 4 and merge onto Jim Wright Fwy/W Loop 820 S. Turn right onto White Settlement Rd. Turn right onto Expedition Dr and our facility will be directly ahead. Drive north on I-820. Take exit 4 and merge onto Jim Wright Fwy/W Loop 820 S. Turn left onto White Settlement Rd. Turn right onto Expedition Dr and our facility will be directly ahead. Drive west on White Settlement Rd. Pass West Elementary School and continue straight. Turn right onto Expedition Dr. Our facility will be directly ahead. Drive southeast on White Settlement Rd. Turn right at Walgreens to stay on White Settlement Rd. Turn left onto Expedition Dr. Our facility will be directly ahead.